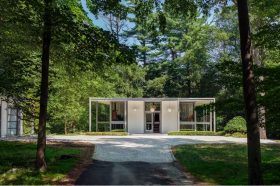 Just an hour outside of NYC in Stamford, Connecticut, a mid-century modern gem is available for sale for the first time in 65+ years, and it’s got some serious celeb history. 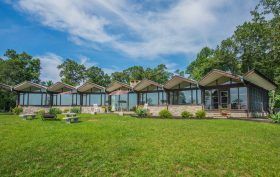 The Post reports that the late Oscar-winning actress Luise Rainer and her husband, publisher Robert Knittel, bought a 6.64-acre site in 1950, “where they enjoyed weekend getaways in a 600-square-foot cottage.” After just a couple years, though, they sold the property to Lester Rossin, one of the original Madison Avenue “Mad Men” advertising executives. 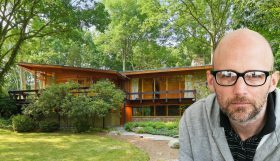 He added a stunning modern home, which was designed to host his “lavish, Hollywood star-lit parties,” according to the listing. Both this main home and Rainer’s cottage have now hit the market for $995,000. 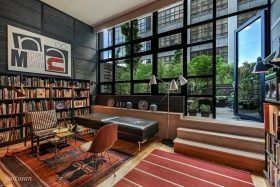 This studio apartment at One Brooklyn Bridge Park looks straight off the set of “Mad Men.” The owner managed to pack plenty of mid-century modern design into just 589 square feet while creating an inventive layout that creates some private spaces within the apartment. Best yet, the studio comes with a big wall of windows, a common feature throughout the Brooklyn Heights development, which leads out to a private terrace. After last selling in 2013 for $672,045, the studio is now on the market asking $810,000. 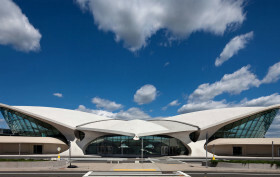 After sitting vacant at JFK Airport for 14 years as a vestige of jet-age architecture, Eero Saarinen‘s iconic 1962 TWA Flight Terminal received a new life in the summer of 2015 when it was announced that the neo-futurist structure would be reborn as a high-end hotel. 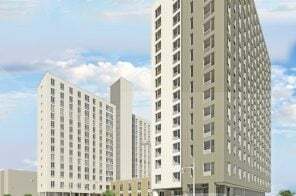 MCR Development teamed up with JetBlue and the Port Authority to develop a “505-room LEED-certified hotel with restaurants, 40,000 square feet of meeting space and a 10,000-square-foot observation deck,” as 6sqft previously described. 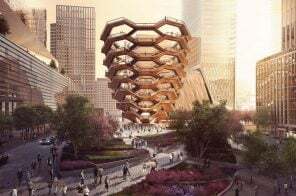 Initial reports referred to the project as the “TWA Flight Center Hotel,” but the Times now confirms that it’ll simply be the “TWA Hotel.” And with construction four months in, Curbed noticed that signage for the hotel has gone up, preserving the airline’s logo and font. 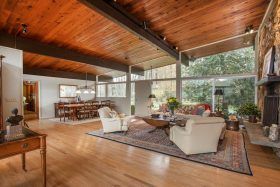 If you’ve got Eichler dreams and Fallingwater fantasies, but don’t live in state that’s abundant with mid-century modern architectural gems, it helps to be on the lookout for homes like this one. 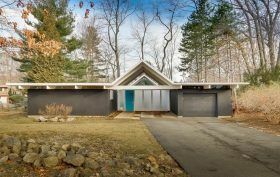 The Rockland County house on over an acre of woods in Wesley Hills, NY, now on the market for $488,000, was built in 1965 by Versland Rhodes, a popular builder of contemporary upstate homes of the day. The four-bedroom home is beautifully preserved, with details like a sunken living room, cherry wood cabinetry and hardwood and stone floors joining conveniences like central A/C. 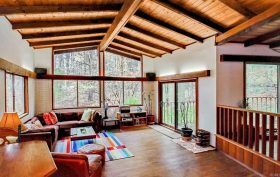 Like many modern homes, every effort was made to minimalize the border between inside and outdoors, so you get to enjoy a wraparound deck, tons of windows and scenic views. Eichler homes are rare on the East Coast, and why be a brand snob? 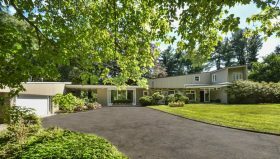 This mid-20th-century gem in West Orange, NJ has plenty of modernist style and views of the NYC skyline. On a private gated road in Essex County, on the southeastern ridge of the Watchung Mountain (known for their many scenic vistas overlooking the New York City and New Jersey skylines and for their rare ecosystems of endangered wildlife, plants and rich minerals) this dramatic crescent-shaped home could be the answer to your modern house dreams. “Restored, not renovated,” the three-bedroom residence has contemporary comforts and mid-century charm, along with a well-engineered floor plan and plenty of outdoor space.